Look no further than Feldco when thinking of Quad Cities window replacement. Replacing your windows is one of the easiest ways to update your home, making it more energy-efficient and comfortable year round. With a variety of style and color options available, you don’t need to compromise beauty for energy efficiency. Get your replacement project started with Feldco today and get the perfect windows for your home. What Makes Feldco The Best Window Replacement Company in the Quad Cities? Since opening its doors in 1976, Feldco has been recognized nationally as one of the top window companies in the country. With over 350,000 happy customers, our focus is not only on satisfying customers, but delighting them by bringing them the best the industry has to offer. We have transformed homes in the Midwest for over 40 years and will continue to do so for years to come. Depending on the look and functionality you want from your new window, you can choose the style that works best for you and your family. You can keep the style of window you have already, or completely transform your home with a new design! Feldco offers a variety of colors and options to help you complete the transformation. Rest assured, all of our windows are energy-efficient and durable so you don’t have to compromise functionality for beauty. 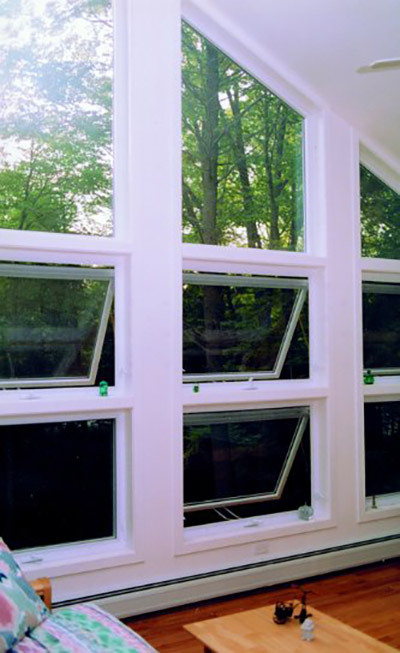 Double hung windows are the windows most homeowners choose for their homes. 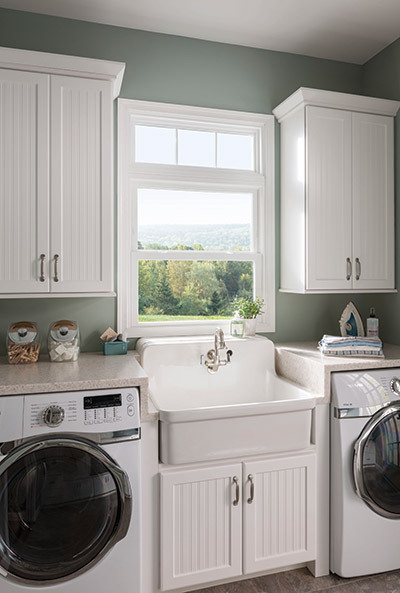 They have two operating sashes that open up for great ventilation and that tilt-in for easy cleaning. Add grids to the top, bottom, or both sashes another way to transform the look of your home. 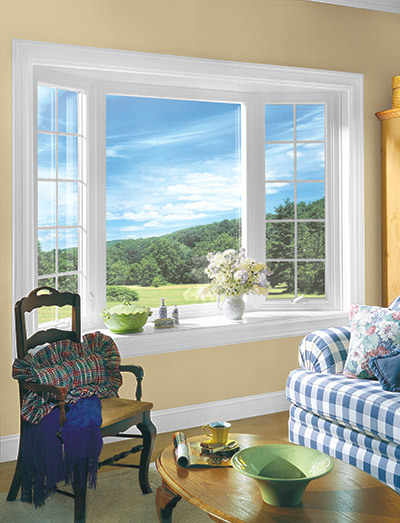 Since double hung windows are so versatile, they are a great addition to any room. 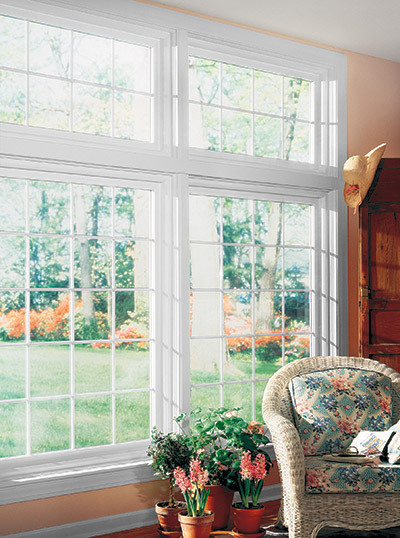 It’s easy to update your home and create a clean, classic look with brand new double hung windows. Casement windows are hinged at the side and are operated by a crank to open outward, away from your home. With the casement window, you have the option to have it open to the left or open to the right, allowing air into your home. Plus, the hand crank lays flush against the window frame when the window is closed to not disturb any of your window treatments. Sliding windows, also known as sliders, operate by sliding side to side. They can be constructed as either a 2-section or 3-section slider depending on the size of your window opening. Much like the double hung, the sashes can be removed for easily cleaning. 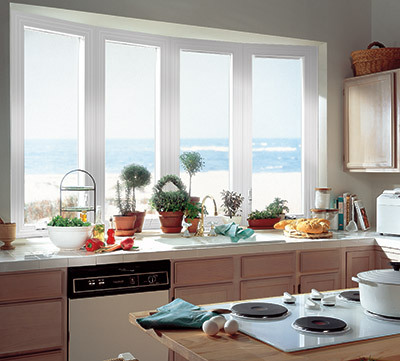 Since sliding windows are low-maintenance, they can be a great addition to kitchens and bedrooms. A bay window extends past your home’s exterior and consists of one large picture window flanked by the window of your choosing on each side. A bow window is similar, but consists of three, four or five equal sized windows to create the overall window opening. Since bay and bow windows add a lot of beauty to a home, they are typically best suited for a room with a view facing your front yard. 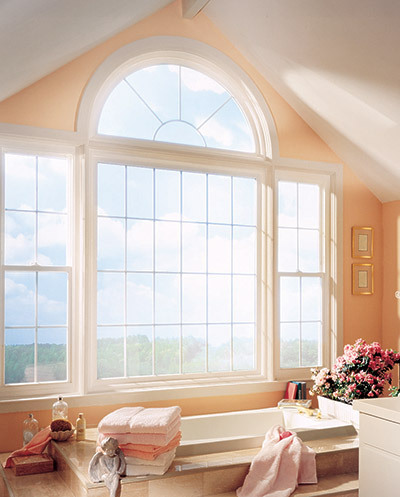 While there are no operating sashes, enjoy the beauty and maximum energy efficiency from our picture windows. They are commonly used to make living rooms and family rooms seem larger by allowing natural light to enter any room. Combine a picture window with any operating window styles to create the perfect window look for your home. Awning windows are hinged at the top and swing open outwards. Since they open out from the top, they provide necessary protection from the elements like rain while still letting air circulate throughout the home. 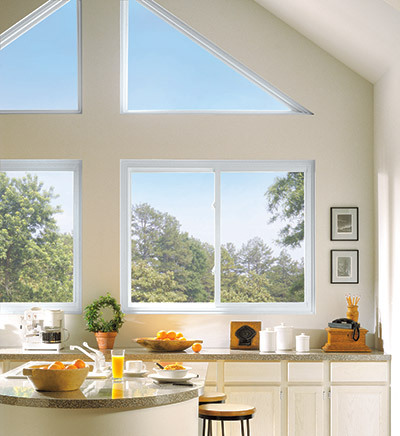 Typically best suited for a smaller window opening, awning windows make a great option for kitchens, bathrooms, and even basements. Basement windows, also known as hopper windows, can brighten up your basement while providing security and improved air flow at the same time. Hopper windows have a single sash that is hinged at the bottom and tilts open inward, making it easy to clean. 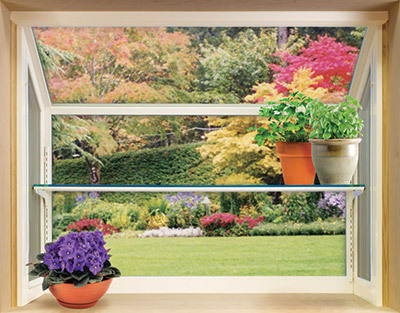 A garden window extends beyond the normal window opening and sticks out past the exterior of your home. This uniquely shaped window allows you to add light and space to any room and, with a venting awning window, allows for air flow as well. Garden windows are typically found in kitchens, right above the kitchen sink because it is easy to access. Accent any room with an architectural or shaped window. They come in a variety of shapes and sizes and are often combined in a pattern to enhance bedrooms, dens, entryways, or hallways. If you are looking to add a unique touch to your home, an architectural window would be perfect for you. The professional window installers that will work on your home are among the best in the industry. They are dedicated to treating your home with care and properly installing your windows so they can provide utmost energy efficiency for your home. The installers are all factory trained, drug tested and background checked to make sure you are receiving nothing but the best experience with your window installation. Rest assured you are in great hands when it comes to your window project! For over 40 years, Feldco has been servicing the Midwest and helping homeowners with their window replacement projects. With a variety of options, affordable prices and professional installation, we aim to make your window replacement project a breeze. What are you waiting for? Get started with your window project today and join over 350,000 delighted Feldco customers.